The slim smaller size of the 3Doodler 2.0 is approximately one-third the width of the previous version. The pen uses both PLA and ABS filament, and you can use nonproprietary filament, although you need to tweak the temperature to do so. The filament feeds quickly and the temperature is manually tweakable. The pen is not that easy to use, but that's more you, not the pen. . Some users report overheating issues with the pen's body. The extruding temperature needs constant adjustment. 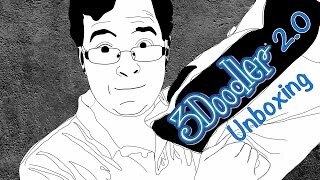 WobbleWorks kicked its first release of 3Doodler up a few notches. 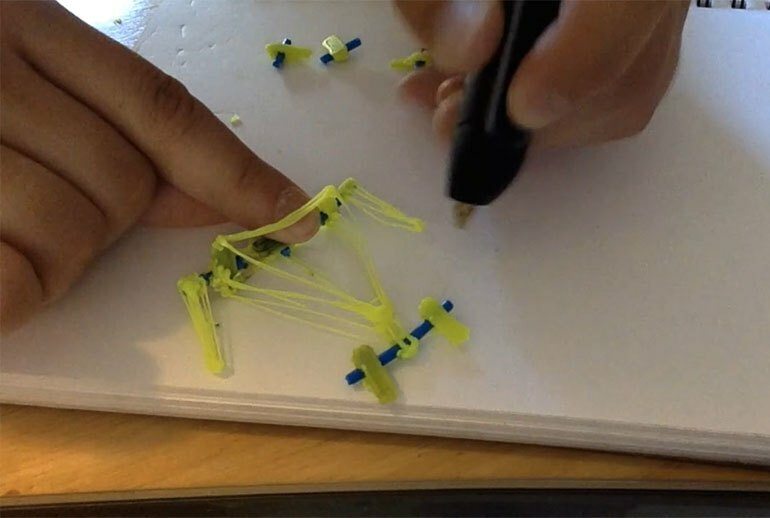 Like 3Doodler 1.0, version 2.0 started with a successful KickStarter campaign. 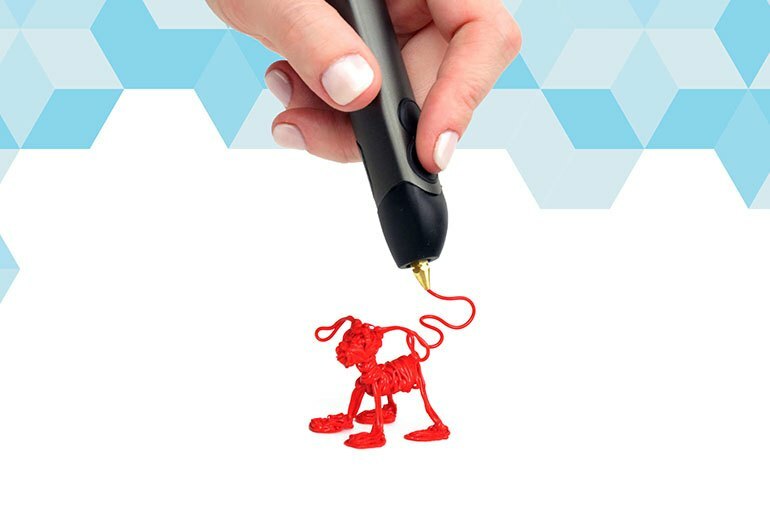 With the 3Doodler, you draw 3D objects in thin air, without templates or a computer. The upgraded aluminum body is about one-third the size of the first 3Doodler, and the company added variable speed extrusion. New accessories include a portable battery and a foot pedal for filament feeding. Supporting both PLA and ABS filament, the 3Doodler can use third-party filament, with temperature adjustment. The 3Doodler 2.0 has an improved nozzle, duel speed controls, a new feeding system and an enhanced fan to cool the plastic quicker. I'm truly excited about the NozzleSet. Using the different nozzles, you can change the shape of the extruded plastic. The set comes with six different nozzles: ribbon tip, square tip, triangle tip, super fine 0.5mm nozzle, and thicker 1mm and 1.5mm. Let’s get to the point. Using the pen is pretty intuitive and the controls are few: a prolonged click to extrude, double click to continuously extrude, press both buttons to retract the filament. Shouldn’t be more than a couple of minutes to understand the basics. 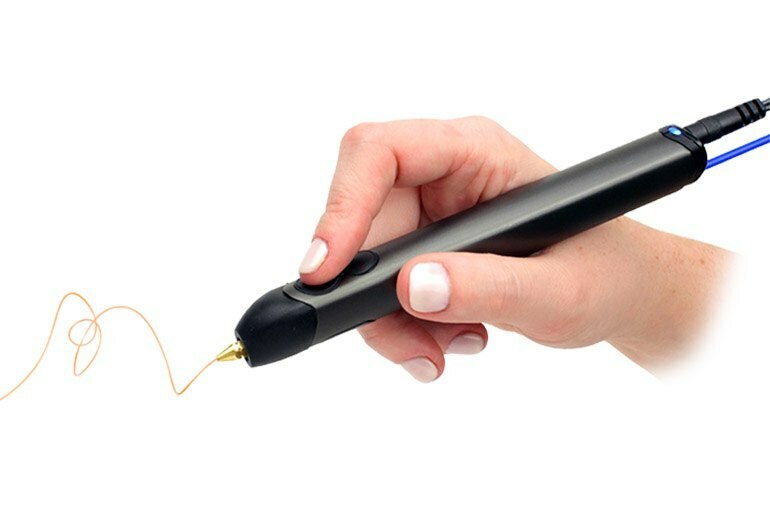 Getting started with the 3Doodler 2.0 is absurdly simple. It’s essentially a freehand 3D printer, and what you lose in precision, you gain in simplicity. The pen-like plastic extruding system let anyone with a little creativity make fun 3D objects. Now the product just got better. WobbleWorks, LLC., is ready to take the nascent creative platform to the next level with a smaller pen that works better, the company promises. Besides being slimmer, the 3Doodler also has some new accessories, such as the JetPack, a portable battery that lets you draw in 3D on the go for 2 to 3 hours depending on the material used. Although it was great fun to use, it was clear that a fair bit of time spent practicing with it would be required to create anything remotely impressive.